Mrs Dragon's Den: Kitty Sushi! Another whirlwind day at work! Including a 2 hour trip to the DMV to get my Alabama license and followed by a trip to Sears for a lawnmower! I'm beat. Double the cards in the shop tomorrow and a kitty item tonight! 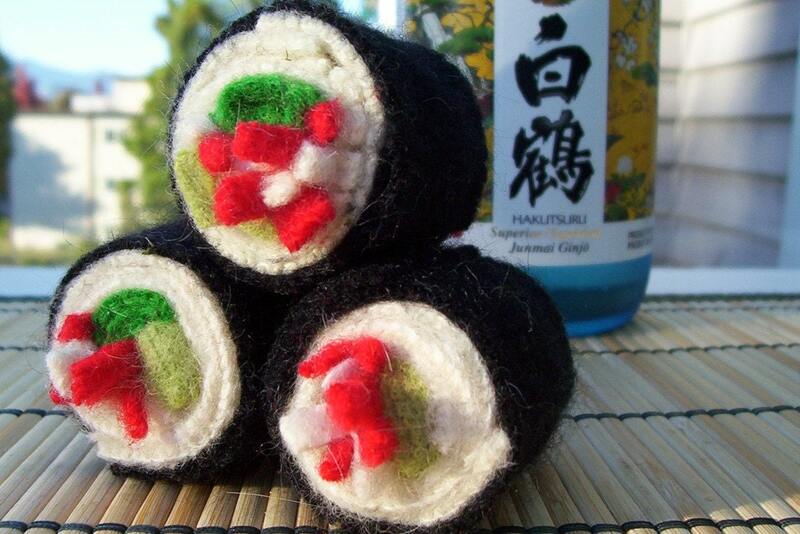 This little toy, from BuenoStyle is made to look like sushi--something I, for one, far prefer in felt! However, the pretty colors and the fuzzy "touch me" quality makes me think that this toy would be loads of fun for both kitty and me. The dangling "crab", "cucumber", and "avocado" give the cat something to bat at, while the toy itself is large enough to be easy handled while you are throwing it for them to chase. One warning though, almost every cat toy I saw on etsy comes with catnip. I have heard (although never verified with a vet) that catnip isn't really great for kittens. The wonderful thing about etsy, though, is that it would be very easy to request a custom toy made without catnip--which I will very likely do.